The Learning Commons, located on the second floor of Mills Library, is a learning space. The Help Desk is open from September to April in the Mills Learning Commons (2nd Floor). 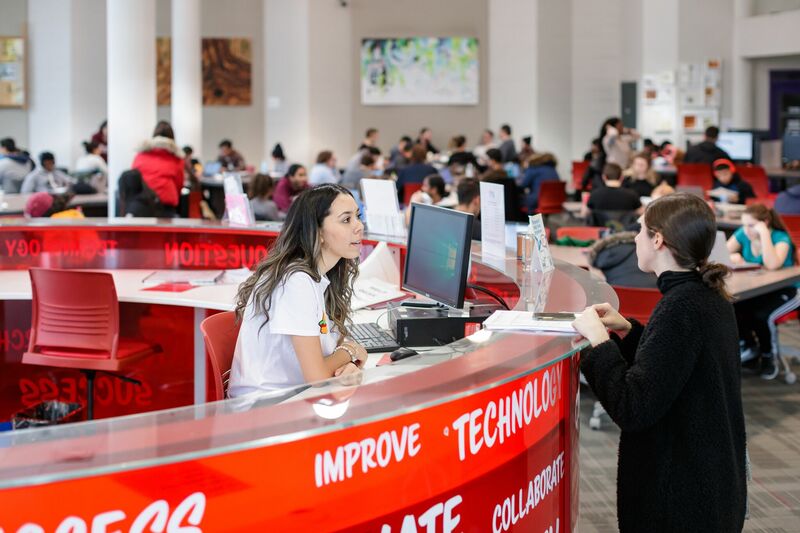 We offer three services at the Learning Commons desk : Library Help, IT Help and Writing Help. Staffed by Mills Library student employee. Offering assistance in Printsmart issues and basic library questions. Staffed by Student Success student volunteer. Offering assistance with essay and lab report writing and studying and time managment. Staffed by a UTS Co-Op student. Offering help with MAC ID issues, student email, Office 365 and Wifi. Do you want to get a few quick resources for starting an essay or managing your time, but don’t want to book a full appointment to talk about it? Do you want to ask questions about some of the services that are available to you? Come to the 2nd floor of Mills Library and talk to an Academic Coach! You can drop-in and talk to them about your studies. They might answer your question right away, or they might help you book an appointment with one of our excellent services on campus. Academic Coaches will be at Info Desk in the Learning Commons from 12:30-4:30 from Monday, Tuesday, Thursday and Friday, 12:30-6:30 on Wednesday. Whether it’s a fully drafted assignment, essay outline, or even scrap pieces of notes that don’t fully make sense just yet, we offer writing assistance that can help you achieve your writing goals. Meet with one of our trained upper-year or graduate Writing and Academic Skills Tutors to talk about your academic writing. Our Tutors cannot proofread, edit, or write your work for you, but they’ll help you build new skills and see your writing in a new way! Get connected with students across campus who are from around the world! Speakeasy brings English language learners and fluent English speakers together to exchange ideas and experiences. Everyone learns in this program as we foster a global mindset on campus! For information about schedules and bookings, please email spkeasy@mcmaster.ca.